Regular readers of the Pterosaur.net blog will have already seen this post and might well have put two and two together and realised that this is ‘Darwinopterus’-like pterosaur from the Solnhofen. We are still waiting some kind of proper description on this (and it’ll need a name too) but it has had a mention in the literature and been on show a number a times. It’s incomplete and disarticulated, but it’s far from a bad specimen and very obviously has the classic features one would expect – a combined nasoantorbital fenestra, a big head, and yet some rather more basal features in the wings and feet. Darwinopterus is the key taxon that helps us join up the basal pterosaurs and pterodactyloids, and there’s been a series of taxa named from the Chinese Daohugou beds that lived alongside this genus (a number of which are probably synonyms to be honest) as had made China the centre for this. 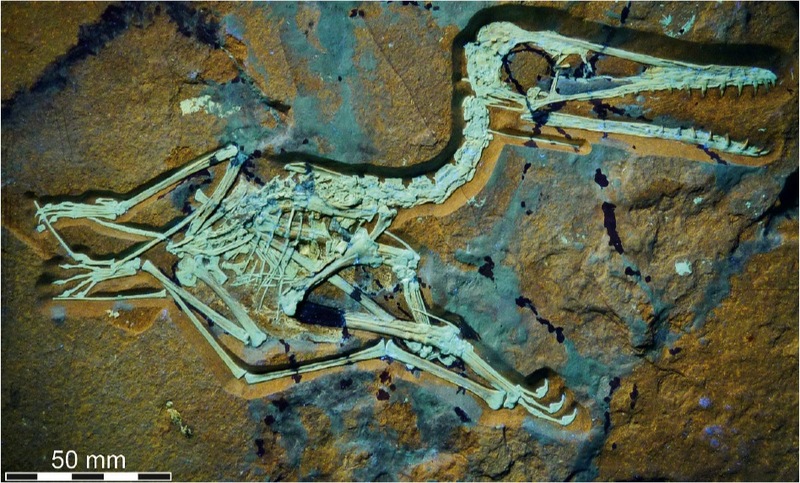 Still, a couple of specimens from the UK have been found (or rather, rediscovered) that suggest these forms might have been more widely distributed and once they appeared in China, the Solnhofen and surrounding beds then became an anomaly – they were full of both pterodactyloids and basal forms, so surely the intermediates might have also hung around and been present given the numbers seen in China. Now though a second one has turned up in Germany and it’s a lovely specimen of what is a small, and juvenile animal. The preservation is superb, and as Helmut Tischlinger has been working on it, there’s obviously some exceptional images, but there’s also some interesting features. The short paper covering this animal is in German, so I might well be repeating things already said in the manuscript, but I’m going from only the English abstract and figure captions and my own thoughts, so this might be badly mangling or even completely replicating things already written. If so, my apologies to the authors or anyone else who has read the paper. For me the more obviously interesting features all lie in the back end of the animal. First off as you can see below the distal phalanx of one wing had had a nasty break and then healed with a mass of bone that least the end at a rather major angle compared to the proximal part. There are a few pterosaur pathological wings out there, but this is quite a big one. Secondly the tail is rather short. In my paper on pterosaur tails with Lu Junchang we suggested that Darwinopterus might have a tail of rather intermediate length between the classic ‘long’ and ‘short’ tails and this specimen might be going the same way. Not only that, but the tail also seems to have relatively short zygopophyses that are barely as long as the abutting centrum, whereas Darwinopterus at least has very Rhamphorhynchus-like ones that are very long. The fifth toe also seems to be something of an intermediate – it is not a small nub like the pterodactyloids, but nor is the second phalanx that long and it’s not curved either as in other basal forms. Finally, the wing metacarpal looks to my eye to be rather longer than in other non-pterodactyloids. In other words, at least some of these features look to me not just to lie between the non-pterodactyloids and pterodactyloids, but actually somewhere between what we see in Darwinopterus-like animals and the pterodactyloids. In short, this is not just a lovely-looking and intriguing specimen, but it certainly helps to fill in the ‘missing’ part of the Solnhofen and surrounding beds (this one is from Painten). 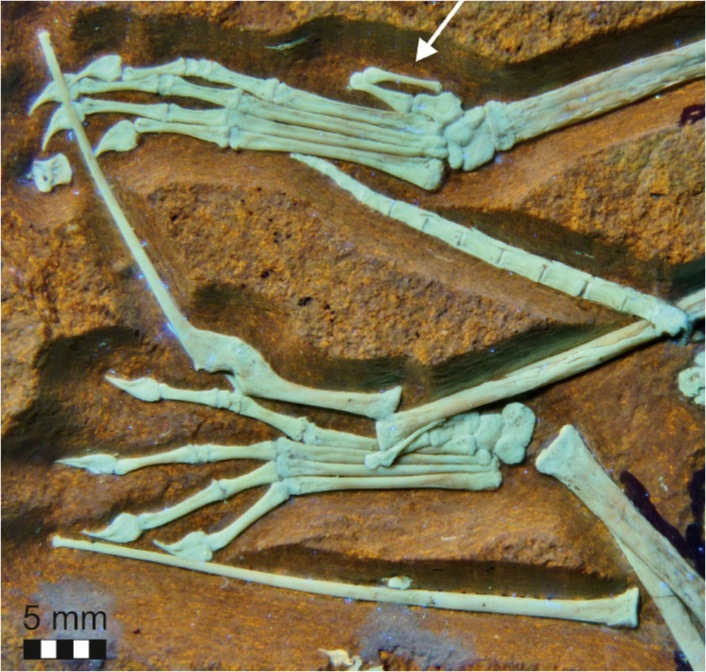 Moreover, at first glance at least, it offers some tantalising prospects for looking at the evolution of characters towards the origin of the pterodactyloids and the changes especially to the wing metacarpals, tail and feet (all key characters for wings / control surfaces) and what this may have meant for their biology. More on this and other specimens is coming, so there’s some interesting work to be done and much to find out. Tischlinger & Frey. 2014. 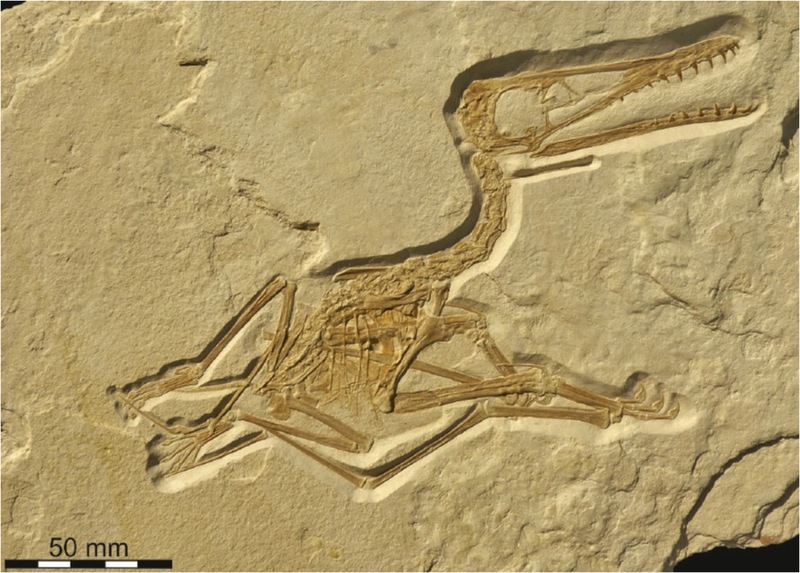 A new pterosaur with mosaic characters of basal and pterodactyloid pterosauria from the Upper Kimmeridgian of Painten (Upper Palatinate, Germany). Archaeopteryx, 31: 1-13. Edit: Helmut has asked me to clarify that in the paper he and Dino do not say this is an animal likely to be specifically part of the Wukonogpteridae (i.e. Darwinopetus and kin) but suggest it is closer to the pterodactyloids. Excellent article! 🙂 It must have been incredibly magnificent in real life! The family is Wukongopteridae, so there’s no need to use unofficial terms like ‘darwinopterid’. Nifty specimen though. lii and Kunpengopterus sinensis gen. et sp. nov. and all its descendants.” but without any kind of phylogeny, it’s not clear if Darwinopertus, Changenhgopterus or something like this actually falls under that definition. If those two are sister taxa then what about the others? I don’t think a phylogeny has yet been published that has all of these animals in (well all the Chinese ones at least). Thus in that context, I don’t think it incorrect to refer to this as being ‘Darwinopeterus-like’, not least when I suspect a good number of readers here who aren’t famialir with the name Wukongopteridae, but would know about Darwinopterus. I agree with Mickey here. There is a name the group containing Wukongopterus/Darwinopterus animals, and they’re clearly more closely related to each other than anything else, even if their relationships to each other aren’t yet clear. I think we can provisionally accept the name for at least the Chinese animals and adapt usage when more detailed analyses come to light. Cladistics is only a means of testing a hypothesis – we can establish names and groups without it. In the mean time, creating a bunch of informal terms like ‘darwinopterid’ or Brian’s term ‘darwinopteran’ just muddies the waters and can – as with ‘Tupuxuaridae/Thalassodromidae’ lead to confusion down the line. From an outreach perspective, there are already papers and books out there using ‘wukongopterid’ so, again, it will minimise confusion to stick with the ‘standard’ name for the time being. How appropriate Wukongopteridae is for this new animal, of course, is debateable – I suspect it isn’t part of this group at all. As you say in the text, it looks like a plesion to Pterodactyloidea, but nestled safely within Monofenestrata. Well I don’t disagree that the formal term for that group is probably Wukongopteridae and it’ll stick in the long term, though it’ll need to be completely redefined I suspect. However, given that this blog is specifically semi-technical and in my experience far more people are familair with Darwinopterus, I don’t think it incorrect to use it in this context. As you note Mark, it’s not helpful to come up with a bunch of informal names and I actually didn’t mean to here: I’d initially done it and then gone back to the less problematic Darwinopeturs-like, only forgot to change the title and it’s a bit late now. Still, I think using terms like this is a blog is rather different to doing it in the literature. Isn’t this circular logic, though? Until people start using the correct terminology more widely, it’s not going to become known. And again, there are semi-technical texts out there using the term already. A search for Wukongopteridae shows that it’s out there, being used online fairly freely. But yes, ‘Darwinopterus-like’ would work fine in this context and mean pedants like me have nothing to moan about. I definitely think that the “correct” term should be used, but understand and agree with Witton that for the casual reader “Darwinopterus-like” works fairly well. But Wukongopteridae was coined not that long after Darwinopterus, as well as virtually all other members of the clade. Darwinopterus is only more noted because it came out in a tabloid journal and thus got tons more press.